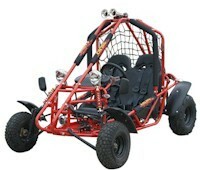 Easy access and easy operation make this Go Kart a perfect solution for every weekend warrior. This Go Kart is designed with driver's comfort in mind. It features a 150cc 4 stroke air cool engine, automatic CVT transmission and reverse drive, accompanied by an electric start and extra internal space. Driver can simply turn on the switch with key and it's ready to go!.